Wine Dining: Where is the V.Q.(EH) ! Where is the V.Q.(EH) ! The point of this is to show that it is now very difficult to tell whether or not a wine is V.Q.A. 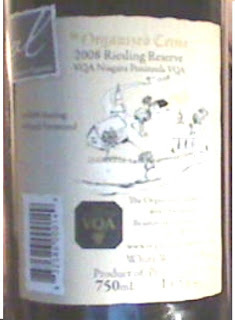 With all the talk of Cellared in Canada wines misleading consumers about the Canadian content in a Canadian produced product, the V.Q. A. is now allowing the designation to be very inconspicuously displayed on the back. In my opinion this is a mistake. The V.Q.A. designation should be prominent on the neck and the front label of a wine . It should be very easy to identify a V.Q.A. wine. 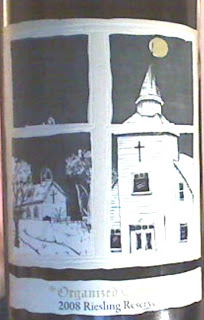 I know that it may not make much difference if the wine is in a segregated section of a LCBO or of a winery that sells nothung else but the medallion is the brand and needs to stand out in amy other situation including things as mundane as putting empty bottles in your recycling box and passers by see it or your your returning your bottles to the beer store and the people behind you see thst your returning Ontario wine.